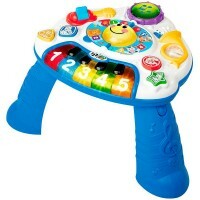 With the cheering and clapping sounds built-in this kids' microphone with a stand you you will always feel like a star! Calling all singing sensations to step into the spotlight! 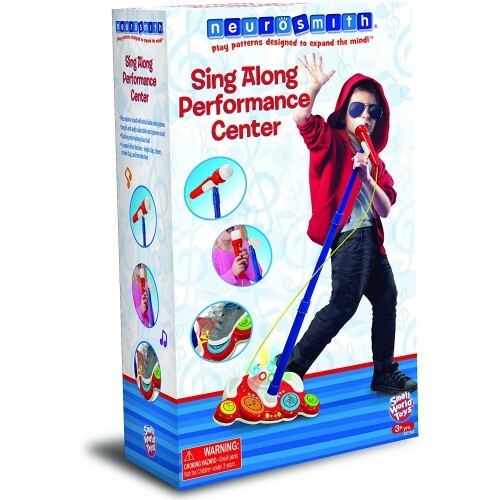 Small World Toys' standing microphone set lets your little star turn any area into an exciting performance stage. 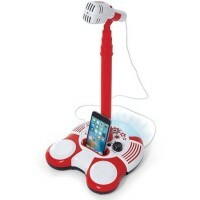 The children's microphone includes an adjustable stand to grow with your child. 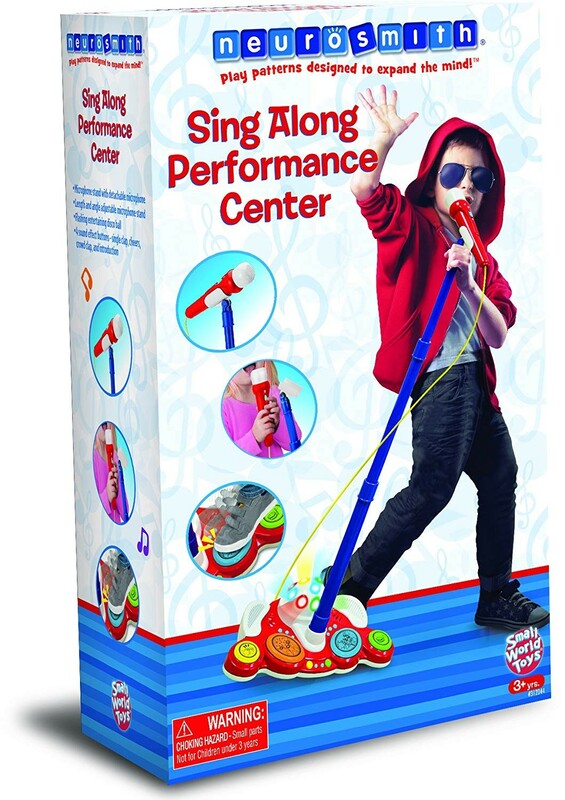 This Kids Sing Along Microphone Performance Center features light effects and 4 sound effects buttons to make single clap, cheers, crowd and introduction. With this mic you can perform for your family and friends signing along with your own music or acapella! Don't have an audience? That's Ok! 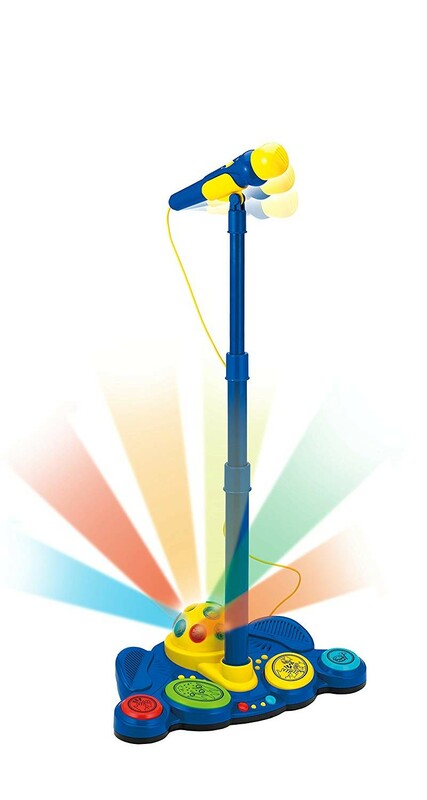 With the cheering and clapping sounds you you will always feel like a star. Cool lights flash along to the music for a glamorous Hollywood effect. And for parent's relief there is an automatic shut-off feature in this mic for children. 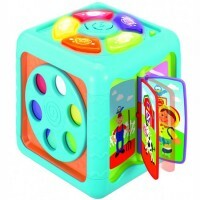 Educational Toys Planet encourages such unique pretend play and emphasizes the musical learning associated with such an engaging toy! 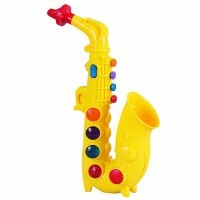 A taste of fame for your little vocalist! 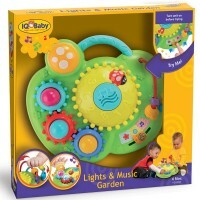 This children play microphone requires 4 AA batteries (not included). 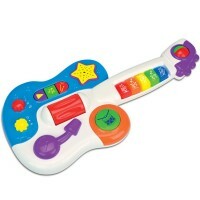 Dimensions of package 4.6" x 9.4" x 15.2"
Write your own review of Kids Sing Along Microphone Performance Center . Rating: 5 by Joseph, NC My 3 year old LOVES this microphone! She can sing along to many songs and enjoys giving concerts for us each evening! Rating: 5 by Bonnie, WA This shouldn't have been the first gift my grand-niece opened on Christmas. We had a terrible time directing her attention to anything else! Played with it ALL DAY. 2 years old and dragged the mic and stand all over the house. Worked perfectly. LOVE the clapping and cheering!! Rating: 3 by Ally, MO Doesn't amplify well unless the child's mouth is on the microphone, so it's frustrating for them. Rating: 5 by Frances, NC Easy to assemble. Height adjustable. Mic worked good. Had good assortment of songs ready for use and you could use something of your own if you wished. Didn't turn over easy. 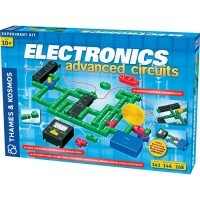 Just a great little educational toy for my 5 year old granddaughter. She absolutely loved it. Rating: 5 by Christen, MI This is so much fun! 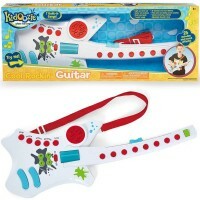 I got it for my niece who just turned 3 and she figured it out right away and had a blast! It is a little loud when its on full blast, but it is adjustable. I would highly recommend it! 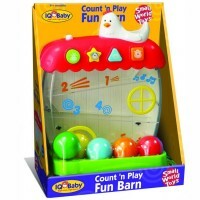 Rating: 5 by Susan, FL We bought this for our grandson's 2nd birthday. When he opened the present, he wouldn't look at anything else. He loved performing for us. The sound level is not too loud, and he loves to sing along with all of the songs, even though he doesn't know the words. Rating: 4 by Joanne, TX It is a Xmas present. Do not open until then. So, you have to wait to see if I like it. Not opening the box or bags until the big day!!!! Rating: 5 by Brandi, FL My daughter is a ham of a performer and this microphone gives her the opportunity to feel like a pro. She loves the songs that come with it and we love the impromtu performances she treats us to. Rating: 4 by Brittany, MO plastic is a little weak, everything else about the product is great, my 2 year old daughter loves this toy. 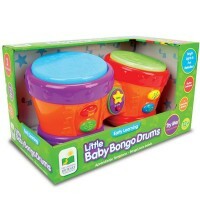 Rating: 5 by Chris, TX The ultimate rating of this product depends on the child,who will receive it as a Christmas gift.I feel sure it will be I LOVE IT. Rating: 5 by Toby, TX on her birthday, this was one of the first presents my granddaughter wanted to use.....big smiles all around.